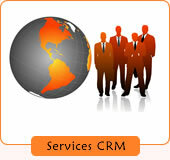 Professional services and CRM software are a symbiotic duo. A professional services firm's most valuable asset is the relationships its professionals nurture with clients and industry colleagues. These relationships are often the source of new business referrals and the single most influential factor in winning new sale opportunities. Top services firms leverage customer relationship management systems to centralize their firm's collective knowledge, experience and relationship networks into a firm-wide asset that can be exploited for successful business development purposes. The professional services industry includes sectors whose products and services are based on professional expertise rather than on discrete products or commodities. Non-good industries are largely made up of retail, wholesale trade and the services industries and account for about 70% of all U.S. economic activity. The services industries alone account for 55% of total U.S. economic activity. Whether architects, accountants, attorneys, management consultants, advertising executives, non-profit stewards or financial services staff, professional services companies must sell and manage the delivery of an intangible solution. Project success only occurs when projects are accurately estimated, delivered according to schedule, completed on time and meet the customer's expectations. Professional Services Automation, or PSA, is the most common industry term to describe the vertically focused CRM business software for the professional services industry. Industry specific business software applications for the professional services industry require both front office and back office features sets and integration in order to accommodate business processes which originate from CRM software and populate back office accounting software systems. Project office administration. This software automation capability is generally focused on managing the project delivery components such as project team members, project activities, project plans, project incidents and the like. Project management. This front office tool typically manages the project profile information as well as the delivery methodology, resource management and change management systems. Time and expense reporting. Consultant billable or non-billable time and expenses are normally captured as part of the CRM project office and later transferred to a back office accounting software system. Project accounting. While the customer facing project aspects are most normally maintained within the CRM project office module, the back office project accounting maintains the financial aspects of the project such as billing type (time and materials, fixed fee or percentage complete), billing methods, billing schedules, revenue recognition method and many other accounting options configured at a project level. Invoicing and billing. Once the consultant time is entered in the front office CRM system, that time must automatically flow to the back office approval processing and subsequent invoice generation process. Cash receipts and collections. Back office invoice and cash receipt processes must update the CRM front office so that the project manager or responsible person have a real-time financial snapshot of the project at all times. Enable increased sales win rates. A PSA system helps companies create more accurate and timely proposals and estimates. Simple access to history permits permits the on-demand recall of prior, similar project estimates which can be reused or modified. Increased resource utilization. Real time resource visibility permits tighter resource management and boosts consultant utilization rates. Increased consistency and higher quality. Real-time notification management and deviation alerts permit action to be taken at the earliest opportunity and before projects slip to recovery mode or a point of no return. Improved project profitability. PSA gives project managers and financial controllers the tools to anticipate and rectify slippage and risks as well as identify and promote the most profitable customers, projects, and services. Increased team performance. PSA gives staffing managers and project sponsors the ability to staff projects with the most skilled or effective resources by giving them instant visibility to both the project pipeline and resource availability. Improved cash flow. By automating time reporting, expense reporting, approval processing, invoice generation and invoice distribution, Accounts Receivable departments are able to expedite billing and cash collection. Reduced administrative activities. When project management, project delivery and billing cycles are automated, billable employees are able to reduce their non-billable time. Intacct and Aplicor each offer PSA software as a service (SaaS) solutions. According to analyst firm Forrester, spending on CRM professional services providers (PSP) services will remain strong due to the continuing shift from customer functional management to customer process management, the need to consistently deliver a better "branded" customer experience, the evolution to the service-oriented architecture (SOA) as the basis for underlying applications and system integration, and the growth of the high-value offshore/near-shore CRM services providers. However, Forrester also notes that four out of 10 enterprises would not fully recommend their CRM PSP to others, demonstrating that choosing a PSP is a risky decision. To avoid implementation failure, buyers must choose a PSP that most closely aligns the needs of the company by understanding the strengths and weaknesses of the six types of CRM PSPs: 1) management consultants; 2) global full-service systems integration firms; 3) North American regional specialists; 4) European regional specialists; 5) offshore or near-shore technology services providers; and 6) software vendor professional services organizations (PSOs). 48/49 Truck transportation, messenger services and warehousing. Professional Services Automation (PSA) software is designed to manage, automate and measure operational effectiveness and performance in key areas such as project delivery, resource utilization, project quality and financial results. By more closely managing key factors such as resource allocation, project plan achievement and cash flow generation, greater project delivery is achieved, surprises and operating costs are reduced, billing cycles are accelerated and bottom line profitability performance is enhanced. PSA software solutions enhance traditional project management disciplines with the information systems tools that enable managers of project-based organizations to analyze the expected benefits of projects, manage projects to forecasted results and ensure profitable ongoing operations. More advanced PSA solutions offer 'Relationship Intelligence', an industry term to describe CRM information systems that illustrate the complex connections between people, companies, relationships, experience and skills or expertise in order to facilitate business development professionals to uncover and leverage these relationship networks into new revenue opportunities.